Richmill 4 th Axis 5C Rotary Head w/ Richmill CNC30 Servo Controller. Strippit Punch Tooling and Cabinets. Roper Whitney Punch Die Sets and Misc Tooling. (4) Huot Drill and Tap Cabinets. Angle Grinders, Pad Sanders and Saws. MicroVu mdl. H-14 14” Floor Model Optical Comparator s/n 2632 w/ MicroVu Q16 Programmable DRO, Surface and Profile Illumination, 5” x 18” Table. Moore &amp; Wright 12” Master Level. Mitutoyo 5”-6”, 4”-5”, 3”-4” OD Mics. Mitutoyo .7”- 4” Dial Bore Gage Set. Mitutoyo 24”, 12”, 8” and 6” Digital Calipers. Meyer Pin Gage Cabinet 0.0115”-0.5005”, 0.061”-0.500”. Meyer Pin Gage Set 0.2515”-0.5005”. Precision 24” x 36” x 4” Granite Surface Plate w/ Stand. TMC mdl. FCG10N6 2000 Lb Cap LPG Forklift s/n 29800108 w/ 2-Stage Mast, 130” Lift Height, Solid WardTires, 1932 Metered Hours. 1997 Fadal VMC 3016HT mdl. 904-1 CNC Vertical Machining Center s/n 9705047 w/ Fadal CNC88HS Controls, 21-Station ATC, CAT-40 Taper Spindle, 10,000 RPM, 422k Memory Expansion, Rigid Tapping,Hugh Speed CPU, Graphics, Servo Coolant, Tool Load Comp, Assist Software, 16” x 36” Table, Coolant. Fadal VMC 4020 mdl. 906-1 CNC Vertical Machining Center s/n 8810769 w/ Fadal CNC88 Controls, 21-Station ATC, CAT-40 Taper Spindle, 10,000 RPM, 20” x 48” Table, Coolant. Lagun / Hasbach 3-Axis CNC Vertical Mill s/n SE-1119 w/ Hasbach Bandit Controls, 3Hp Motor, DialChange RPM, 30-Taper Spindle, Power Draw-Bar, Chrome Ways, 9” x 42” Table. Strippit Fabri-Center 1000 III 30-Ton CNC Turret Punch Press s/n 9367042788 w/ GE Fanuc Series 6Controls, 33-Station Thin Turret, (3) Indexable Tool Stations, Automatic Sheet Repositioner, 46” x 78”Ball-Top Table. Wysong mdl. H-60- 72 60-Ton x 72” CNC Press Brake w/ Dynabend III Controls and Back Gaging, 72” BedLength, 2 ½” Stroke, 3” Ram Adj., 12” Max Die Space, 53 ¾” Between Uprights.Wysong mdl. 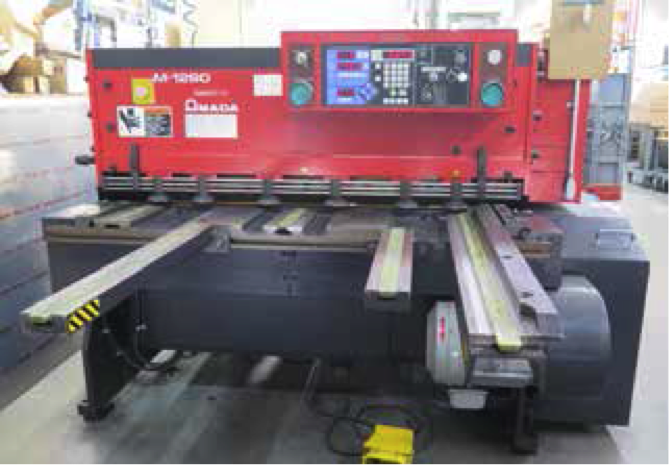 H-2052 20-Ton x 52” CNC Press Brake s/n HPB12-239 w/ Dynabend I Controls and Back Gaging, 52” Bed Length, 2 ½” Stroke, 3” Ram Adj., 9” Max Die Space, 37 ¾” Between Uprights. DiAcro mdl. 14-48- 2 17 Ton 14GA x 48” Hydra-Power Press Brake s/n 6820679485 w/ Manual BackGaging, 48” Bed Length, 6 ½” Throat Depth, 36” Between Uprights. 1999 Amada M-1260 ¼” Cap x 4’ Power Shear s/n 12600467 w/ Amada Digital Controls and Back Gaging,60 Strokes/Min, 47” Squaring Arm, 31 ½” and 22 ½” Front Material Supports. Strippit “Super 30-30 Fabricator” 30 Ton Fabrication Punch Press s/n 194222682 w/ ¼” Cap, Nibble and Single Modes, Duplicator Attachment, 1 ½” and 4 ½” Die Heads, 34” Throat, 48” x 72” Table. Amada CS-220 8 5/8” x 8 5/8” x 1/8” Power Notcher s/n 544689 w/ 10 Ton Cap, Fence System. Ramco mdl. 37-72 36” Belt Grainer s/n 2303 w/ 36” Belt Feed, Torit mdl. 20-5- FM-55 Dust Collection System. Haeger mdl. HP6-B 6-Ton x 18” Hardware Insertion Press s/n 947 w/ Tooling. (2) Roper Whitney mdl. 58 5-Ton Kick Punches s/n’s 3794-11- 79, 3577-3- 78 w/ 18” Throat. 24” Pinch Roll w/ 2” Rolls.DiAcro “Notcher No. 1” 6” x 6” Hand Corner Notcher s/n A-5567 w/ 12” x 18” Table.DiAcro “Finger Brake No. 12” 12” Finger Brake s/n 1026. DiAcro “Roller No. 2A” 12” Hand Roll s/n GB-2080 w/ 2” Rolls. DiAcro “Shear No. 1” 16GA x 6” Cap Hand Shear s/n E1528. Cadillac 1428G 14” x 28” Geared Head Gap Bed Lathe s/n 567360 w/ 83-1800 RPM, Inch Threading,Tailstock, Trava-Dial, KDK Tool Post, 5C Collet Closer, 8” 3-Jaw Chuck, Coolant. Bridgeport Vertical Mill s/n 278301 w/ Acu-Rite Programmable DRO, 2Hp Motor, 60-4200 Dial Change RPM, Chrome Ways, Power Feed, 9” x 48” Table. Pedrazzoli “MEC BROWN 75” 12” Miter Cold Saw w/ Manual Clamping, Work Stop, Bench and Material Supports. Rockwell mdl. 14 14” Vertical Band Saw s/n KK2642 w/ 14” x 14” Table.Washington Pedestal Carbide Tool Grinder. Wilton Bench Model Drill Press. (2) Orbit Bench Model Drill Presses. Burr King mdl. 33 “Vibra Burr” Media Tumbler w/ 13” x 31” Tub. Makita 14” Abrasive Cutoff Saw. 1 ½” and 1” Belt Sanders. Custom Router Table w/ Hitachi Router. 1996 Kaeser SM8 7.5Hp Rotary Air Compressor s/n 085688 w/ 30 CFM @ 10PSIG, 2180 Metered Hours. 10Hp Horizontal Air Compressor w/ 120 Gallon Tank. Linde UCC-305 300 Amp TIG – Stick Arc Welding Power Source s/n C80G15059. Linde VI-252 250 Amp CV-DC Arc Welding Power Soirce s/n B83E33220 w/ MK Products Cobramatic MIG Welder.Miller Millermatic Vintage 200 Amp CV-DC Arc Welding Power Source and Wire Feeder s/n KF846664. Janda R30-18R 30kVA x 18” Spot Welder s/n R-3224 w/ Janda J400.300 Digital Welding Controls. Welding Torch Cart w/ Tanks and Acces.